One of the most popular landscape palms, the stout form of the Canary Island Date Palm is a familiar sight in most warm temperate, sub-tropical and tropical landscapes. The Canary Island Date Palm is known for it's massive trunk, long arching green fronds and pineapple when trimmed near the top of the trunk. The Canary can stretch for nearly 30 feet wide. The trunk can be 4 feet across. This Impressive palm looks right at home along avenues or city streets, at front entrances to developments or as a centerpiece palm at your home! The Canary Island Date Palm can withstand temperatures into the low twenties and even the upper teens for short durations. 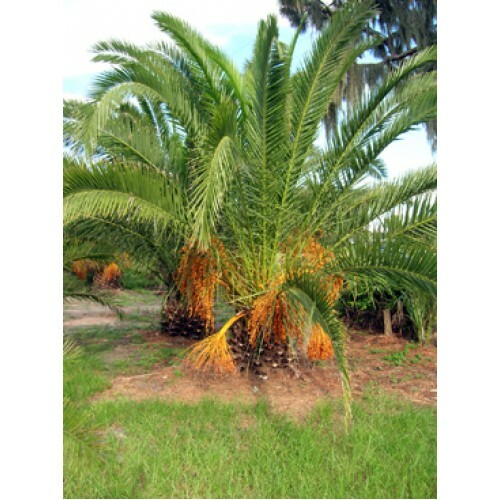 The palm is very drought tolerant and should be planted in a fast draining area or planted slightly above grade to assure drainage. A Quality Plant has many sizes to choose from from container palms up to specimen Canary Island Date Palms with 30 feet of trunk!